Nellikai Oorugai (Gooseberry Pickle) is a popular pickle variety across South India, especially during the hot summer season. They are best served with curd rice. 1. Steam cook the gooseberries in pressure cooker till one whistle. 2. Allow it to cool. Remove inner seed and separate into flakes. 3. Mix with salt, turmeric, chilli powder and lemon juice. 4. Heat oil, add mustard seeds and when it splitters remove from fire. 5. Cool down to room temperature and mix with pickle, along with powdered spices. 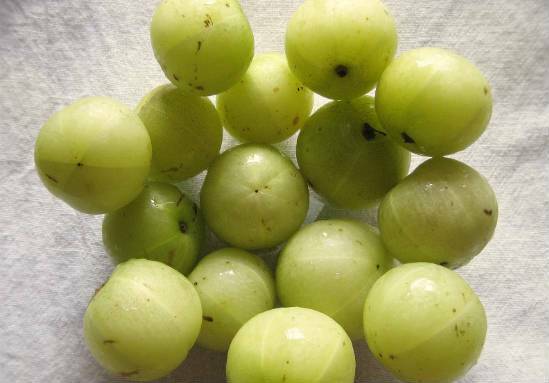 Feel free to comment or share your thoughts on this Gooseberry Pickle (Nellikai Oorugai) Recipe from Awesome Cuisine.